I am always taking classes of one sort or another. Several years ago I took a studio art class at the university where I work. This Crafts class was fun, but time-consuming. We learned about and practiced papermaking, book making (my favorite), jewelry design (my least favorite), textile design, and weaving. Additionally, an original final project of each student’s choosing (including a class demonstration/brief presentation) was required. No store-bought kits were allowed to be used. For my final project I chose to do a cross-stitch design of a poem I wrote and published several years earlier. I began the project over Spring Break because I knew that it would take me the full two months to complete it since it is rather large and the stitches (little x’s) are tiny. The process is laborious and time-consuming. I’ve made smaller cross-stitch projects in the past, but they were all from store-bought kits with preprinted designs. This time was different because the design was larger, original, and required me to actually count the squares on the soft, white, fringed 18” x 16” fabric in order to accurately map out the design so that it was properly spaced. For eight weeks I diligently worked on my cross-stitch for a couple of hours most evenings and several hours on the weekends, including a couple of 8-hour stretches on Sundays. Upon viewing the completed project in its glass-covered frame it is obvious to the observer that a lot of time and effort were involved in its creation. My professor exclaimed, “It’s beautiful!” on the last day of class when all final projects were due. In addition to feeling thoroughly exhausted from four months of creating art (not to mention the stresses of my full-time job), I also felt a strong sense of validation and satisfaction. 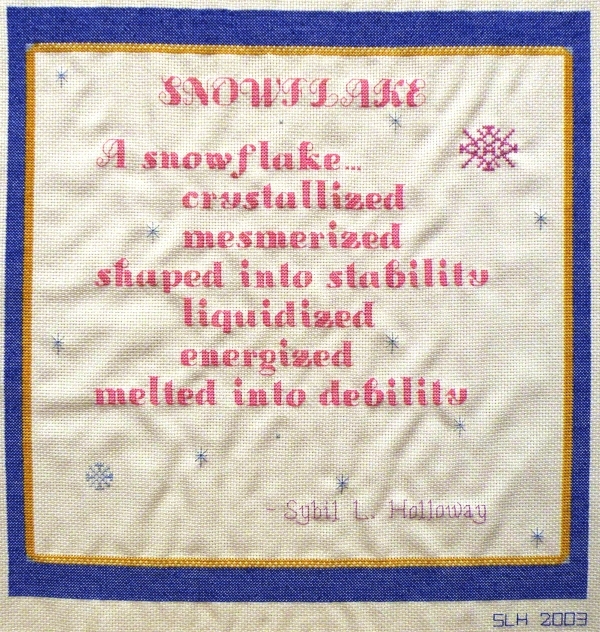 I, too, am extremely pleased with my cross-stitched “Snowflake” poem which is proudly hung on my wall at home. This is one project that I can gladly display.